Hyperbaric oxygen therapy (HBOT) is the administration of high concentrations of oxygen within a pressurized chamber. HBOT has become the definitive therapy for patients with decompression illness, gas embolism, and severe acute carbon monoxide poisoning. It is now widely accepted in treatment of osteoradionecrosis, soft tissue radionecrosis and delayed wound healing. However, the role of HBOT in the treatment of patients with brain injuries is controversial. Brain injury can be caused by an external physical force (traumatic brain injury, or TBI) with rapid acceleration or deceleration of the head and bleeding within or around the brain leading to cerebral hypoxia and passage of toxic substances through the blood-brain barrier. These result in a temporary or permanent impairment of cognitive, emotional, and/or physical functioning. For brain injury there is a strong sense that conventional treatment has had little impact on outcome. The use of various diagnostic and therapeutic interventions, viz, prehospital intubation, intracranial pressure (ICP) monitoring, ICP-directed therapy, and brain computed tomography scan utilization vary considerably among different centers. Such variation signifies a lack of consensus on clinical effectiveness. Predicting the outcome of pediatric brain injury is difficult. Prognostic instruments, such as the Glasgow Coma Scale (GCS) for brain injury, are not precise enough to reliably predict an individual patient's mortality and long-term functional status in pediatric patients. The purpose of this article is to provide a guide to the strengths and limitations of HBOT in treating children with brain injury. We studied a total of 54 patients of head injury. Out of them 28 received HBOT (study group, n = 28). Only cases with severe head injury (GCS < 8) with no other associated injury were included in the study group. After an initial period of resuscitation and conservative management (10 days), all were subjected to three sessions of HBOT at 1-week interval each. This study group was compared with a matched control group of similar severity of head injury (GCS < 8) selected by randomization. HBOT is the inhalation of 100% oxygen inside a hyperbaric chamber pressurized to greater than 1 atmosphere (atm). HBOT causes both mechanical and physiologic effects by inducing a state of increased pressure and hyperoxia. Hyperbaric oxygen pressure is expressed in multiples of atmospheric pressure at sea level, where 1 atm is about 760 mm Hg or 1 kg/cm 2 . The oxygen dissolved in blood at 1 atm (sea level) in room air is 0.3 ml/dL, and this is in addition to hemoglobin-bound oxygen. Inhalation of 100% oxygen at 1 atm increases blood oxygenation to 1.5 ml/dL. Increasing the pressure to 3 atm increases the blood oxygen (dissolved oxygen, not carried by hemoglobin) to 6 ml/dL. At rest and with good perfusion, tissues require 5-6 ml/dL of oxygen, whether from dissolved or hemoglobin-bound oxygen. Hence, in situations where hemoglobin-bound oxygen is limited (e.g., carbon monoxide poisoning), tissue oxygen needs can be met in this manner. In addition, the increased pressure reduces the volume of gases in the blood by virtue of Boyle's law (in an enclosed space, the volume of a gas is inversely proportionate to the pressure exerted upon it). This very mechanism is relied upon in decompression illness and arterial gas embolism to reduce the size of the gas bubbles and allow replacement of inert gas in the bubbles with oxygen, which can be metabolized by tissues. HBOT can be administered by two ways, using monoplace chamber or multiplace chamber. The monoplace chamber, which we used in our study, serves one patient at a time. The initial cost of setup is less but it provides limited opportunity for patient intervention while in the chamber. These chambers are generally constructed of acrylic or with view ports that allow for patient observation. These chambers are pressurized with 100% oxygen. Multiplace chambers allow medical personnel to work in the chamber. Each patient is given 100% oxygen through a facemask, tight-fitting hood or endotracheal tube. The entire multiplace chamber is pressurized with air, so medical personnel may require a controlled decompression, depending on the duration of exposure to the hyperbaric environment. The duration of an HBOT session in common practice is about 90-120 minutes, however, the duration, frequency, and cumulative number of sessions have not been standardized. The dose received by the patient may be affected by the type of chamber used. Monoplace chambers using face masks or hoods that do not fit snugly may result in dilution of 100% oxygen with room air. The study and the control groups were compared on various clinical, social and functional parameters where study group (receiving HBOT) showed distinct advantage over the control group [Table 1]. 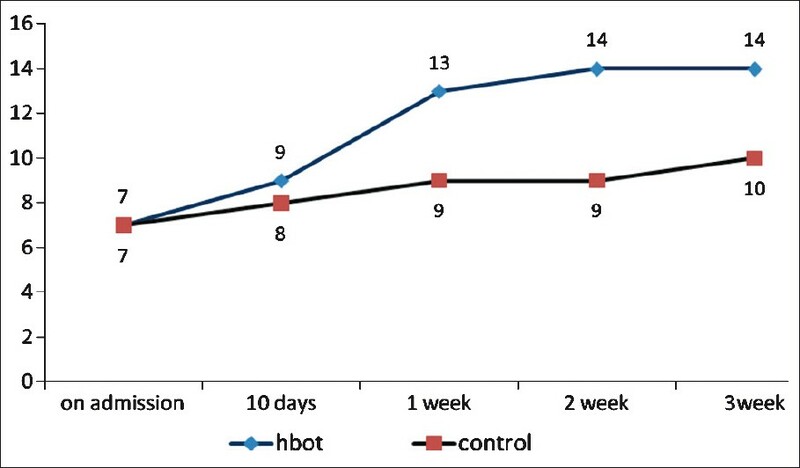 On contrasting the GCS of both the groups; observed at the time of admission, after 10 days of conservative management and then at 1-week interval, it was quite evident that patients who recieved HBOT showed marked improvement as compared to the study group [Figure 1]. In acute TBI, hypoxia and hypotension are independently associated with increased mortality and morbidity. Thus, secondary ischemia and oxygen deficiency are thought to be important mechanisms of cell death in TBI. Aggressive management of trauma significantly reduces the hypoxic and ischemic episodes, but does not eliminate it. For this reason, there is renewed interest in finding more effective strategies for ensuring adequate oxygenation and redistributing cerebral blood flow (CBF) to injured areas of the brain. Many brain-injured patients progress spontaneously from coma to consciousness and eventually recover some of the cognitive functions. This phenomenon of spontaneous recovery from brain injury implies that some brain cells that have lost function can regain it, sometimes after long periods of time. Several theories of recovery after injury in the central nervous system invoke the concept of temporary, reversible inactivity of brain tissue to explain this phenomenon. The use of HBOT for chronic brain injury is based on the theory that, in any brain injury, there are inactive cells that have the potential to recover. According to this theory, these "idling neurons" exist in the ischemic penumbra, a transition area of dormant neurons between areas of dead tissue and the unaffected healthy tissue. ,,,, The oxygen availability to these cells stimulates the cells to function normally, reactivating them metabolically or electrically. In children with TBI, the addition of HBOT significantly improved outcome and quality of life and reduced the risk of complications. HBOT for brain injury is not likely to gain acceptance in routine clinical use until a clinical method of assessing its effectiveness in the individual patient is validated. Specifically, the diagnostic value of SPECT scans and of other intermediate indicators of the effects of HBOT should be examined by large and high-quality studies. A longitudinal cohort study in which all patients undergo proper diagnostic evaluation as well as standardized follow-up tests would be a more prudent and ideal approach. 1. Robertson CS. Management of cerebral perfusion pressure after traumatic brain injury. Anesthesiology 2001;95:1513-7. 2. Bulger EM, Nathens AB, Rivara FP, Moore M, MacKenzie EJ, Jurkovich GJ. Management of severe head injury: Institutional variations in care and effect on outcome. Crit Care Med 2002;30:1870-6. 3. Thurman DJ, Alverson CA, Brown DB, Dunn KA, Guerrero J, Johnson R et al. Traumatic brain injury in the United States: A report to Congress. Atlanta, GA: Centers for Disease Control and Prevention, National Center for Injury Prevention and Control; 1999. 4. Thurman DJ, Alverson CA, Dunn KA, Guerrero J, Sniezek JE. Traumatic brain injury in the United States: A public health perspective. J Head Trauma Rehabil 1999;14:602-15. 5. Jennett B, Bond MR. Assessment of outcome after severe brain damage. Lancet 1975;1:480-4. 6. Teasdale G, Jennett B. Assessment and prognosis of coma after head injury. Acta Neurochir (Wien) 1976;34:45-55. 7. Teasdale G, Jennett B. Assessment of coma and impaired consciousness: A practical scale. Lancet 1974;2:81-4. 8. Lewin W, Marshall TF, Roberts AH. Long-term outcome after severe head injury. BMJ 1979;2:1533-8. 9. Thomsen IV. Late outcome of very severe blunt head trauma: A 10-15 year second follow-up. J Neurol Neurosurg Psychiatry 1984;47:260-8. 10. Lyle DM, Pierce JP, Freeman EA, Bartrop R, Dorsch NW, Fearnside MR, et al. Clinical course and outcome of severe head injury in Australia. J Neurosurg 1986;65:15-8. 11. Schalen W, Hansson L, Nordstrom G, Nordström CH. Psychosocial outcome 5-8 years after severe traumatic brain lesions and the impact of rehabilitation services. Brain Inj 1994;8:49-64. 12. Marshall LF, Gautille T, Klauber MR, Eisenberg HM, Jane JA, Luerssen TG, et al. The outcome of severe closed head injury. J Neurosurg 1991;75:S28-36. 13. Levin HS, Gary HE Jr, Eisenberg HM, Ruff RM, Barth JT, Kreutzer J, et al. Neurobehavioral outcome one year after severe head injury: Experience of the Traumatic Coma Data Bank. J Neurosurg 1990;73:699-709. 14. Susman M, DiRusso SM, Sullivan T, Risucci D, Nealon P, Cuff S, et al. Traumatic brain injury in the elderly: Increased mortality and worse functional outcome at discharge despite lower injury severity. J Trauma 2002;53:219-24. 15. Clark DE, Ryan LM. Concurrent prediction of hospital mortality and length of stay from risk factors on admission. Health Serv Res 2002;37:631-45. 16. Marmarou A, Anderson RL, Ward JD, Choi SC, Young HF, Eisenberg HM, et al. Impact of ICP instability and hypotension on outcome in patients with severe head trauma. J Neurosurg 1991;75:S59-66. 17. Schreiber MA, Aoki N, Scott BG, Beck JR. Determinants of mortality in patients with severe blunt head injury. Arch Surg 2002;137:285-90. 18. Katz DI. Brain injury. In: Gilchrist JM, editor. Prognosis in neurology. Boston: Butterworth-Heinemann; 1998. p. 31-8. 19. Keyser-Marcus LA, Bricout JC, Wehman P, Campbell LR, Cifu DX, Englander J, et al. Acute predictors of return to employment after traumatic brain injury: A longitudinal follow-up. Arch Phys Med Rehabil 2002;83:635-41. 20. Novack TA, Bush BA, Meythaler JM, Canupp K. Outcome after traumatic brain injury: Pathway analysis of contributions from premorbid, injury severity, and recovery variables. Arch Phys Med Rehabil 2001;82:300-5. 21. Andrews PJ, Sleeman DH, Statham PF, McQuatt A, Corruble V, Jones PA, et al. Predicting recovery in patients suffering from traumatic brain injury by using admission variables and physiological data: A comparison between decision tree analysis and logistic regression. J Neurosurg 2002;97:326-36. 22. Chesnut R, Carney N, Maynard H, Patterson P, Mann N, Helfand M. Evidence Report: Rehabilitation for Traumatic Brain Injury. Rockville, MD: Agency for Health Care Policy and Research Report Number 2; 1999:1-81. 23. Fandino J, Stocker R, Prokop S, Trentz O, Imhof HG. Cerebral oxygenation and systemic trauma related factors determining neurological outcome after brain injury. J Clin Neurosci 2000;7:226-33. 24. Robertson CS, Valadka AB, Hannay HJ, Contant CF, Gopinath SP, Cormio M, et al. Prevention of secondary ischemic insults after severe head injury. Crit Care Med 1999;27:2086-95. 25. Barrett K, Harch P, Masel B, Patterson J, Corson K, Mader J. Cognitive and cerebral blood flow improvements in chronic stable traumatic brain injury induced by 1.5 ATA hyperbaric oxygen. Undersea Hyperb Med 1998; 25:9. 26. Neubauer RA, Gottlieb SF, Miale A Jr. Identification of hypometabolic areas in the brain using brain imaging and hyperbaric oxygen. Clin Nucl Med 1992;17:477-81. 27. Neubauer RA, Gottlieb SF, Pevsner NH. Hyperbaric oxygen for treatment of closed head injury. South Med J 1994;87:933-6. 28. Neubauer RA, James P. Cerebral oxygenation and the recoverable brain. Neurol Res 1998;20 Suppl 1:S33-6. 29. Harch PG, Neubauer RA. Hyperbaric oxygen therapy in global cerebral ischemia/anoxia and coma, Chapter 18. In: Jain KK, editor. Textbook of hyperbaric medicine. 3rd rev. ed. Seattle, WA: Hogrefe and Huber Publishers; 1999. 30. Miljkovic-Lolic M, Silbergleit R, Fiskum G, Rosenthal RE. Neuroprotective effects of hyperbaric oxygen treatment in experimental focal cerebral ischemia are associated with reduced brain leukocyte myeloperoxidase activity. Brain Res 2003;971:90-4. 31. Rosenthal R, Silbergleit R, Hof P, Haywood Y, Fiskum G. Hyperbaric oxygen reduces neuronal death and improves neurological outcome after canine cardiac arrest. Stroke 2003;34:1311-6. 32. Zhou Z, Daugherty WP, Sun D, Levasseur JE, Altememi N, Hamm RJ, et al. Protection of mitochondrial function and improvement in cognitive recovery in rats treated with hyperbaric oxygen following lateral fluid-percussion injury. J Neurosurg 2007;106:687-94. 33. Rosenthal G, Hemphill JC, Sorani M, Martin C, MorabitoD, Meeker M, et al. The role of lung function in brain tissue oxygenation following traumatic brain injury. J Neurosurg 2008;108:59-65. 34. Tolias CM, Kumaria A, Bullock RM. Hyperoxia and traumatic brain injury. J Neurosurg 2009;110:607-9. 35. Rockswold SB, Rockswold GL, Vargo JM, Erickson CA, Sutton RL, Bergman TA, et al. Effects of hyperbaric oxygenation therapy on cerebral metabolism and intracranial pressure in severely brain injured patients. J Neurosurg 2001;94:403-11. 36. Neubauer R, Ljubljana S, James P. Hyperbaric oxygenation: The recoverable brain in certain pediatric patients. Presented at: 8th International Child Neurology Congress; 1998. 37. Neubauer RA. Idling neurons. Lancet 1990;335:1217. 38. Neubauer RA, Gottlieb SF, Kagan RL. Enhancing "idling" neurons. Lancet 1990;335:542. 39. Kindwall EP, Whelan HT, editors. Hyperbaric medicine practice. Flagstaff, AZ: Best Publishing Company; 1999. 40. Scheinkestel C, Bailey M, Myles P, Jones K, Cooper DJ, Millar IL, et al. Hyperbaric or normobaric oxygen for acute carbon monoxide poisoning: A randomised controlled clinical trial. Med J Aust 1999;170:203-10.